Arcade Video Game published 23 years ago by Midway Mfg. 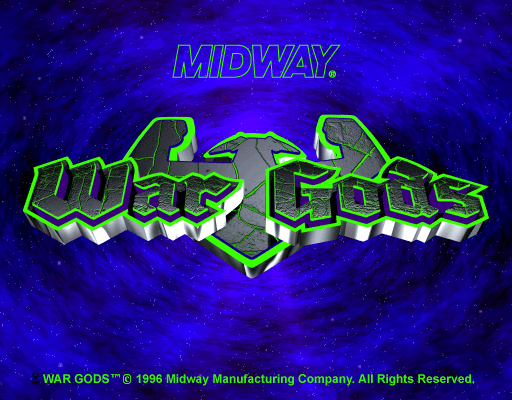 War Gods © 1996 Midway. 10 mystical characters and 2 end bosses battle for dominance in a 3-D environment. Billions of years ago, an alien soldier was transporting his civilization's life giving ore. The creation of the solar system caused his ship to crash, scattering the ore throughout the newly formed earth. Over time, ten humans came in contact with the ore; they were transformed into super-evolved warriors. These are the 'War Gods'! They battle each other for ore to determine the fate of the earth. This game is the only game on the Midway V Unit to use a hard-disk (401 megabyte). Only about 100M of the hard drive is used. 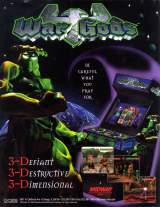 War Gods was the first truly 3-D fighting game to include the Digital Skin Technology that eliminates polygon look. Michael Jackson used to own this game. It was sold at the official Michael Jackson Auction on Apr. 24th, 2009. Make-Up/Costumes : Art Anthony (Make-Up/Costumes/Armor), Cindy Maniates, Costume Exchange Inc.